The Panasonic EP1285KL is a chair that was designed with the common user in mind. But, that does not mean it was created with less features than a professional chair. On the contrary, the Panasonic EP1285KL was developed so that the everyday user could have the spa-like experience that they deserved without the continual cost of going to the spa. As such, it created an accessible machine that is working its way up to the top of the massage chair list with every new season. There are several reasons why this chair is so popular among users. At the top of the list, though, would have to be the immense amount of features that it has on each model. Panasonic is a trusted name in the business. From electronics to other gadgets. Their reputation of extravagance at an affordable price does not stop with home entertainment. Chairs like the EP1285KL are feature packed and are amazingly popular because Panasonic has brought along this reputational value to this line of products as well. If you are still skeptical, keep reading to learn what you need to know about this amazingly awesome and impressive chair. The Panasonic EP1285KL has created a chair that the user can literally click a button and start receiving a massage. This is possible because of the four pre-programmed massage options. Each of these programs was created to mimic the feel of a spa and a human-given massage. There are options like Shiatsu and Chiro. There is a Swedish selection as well. What takes these massages to the next level is there combination opportunities with the intensity options as well. That means that those who utilize this chair can choose their intensity levels as well. In fact, there are five different selections in intensity that can be combined with a massage and that makes it a great and wonderful chair with multiple combination options. The goal of the Panasonic brand is to provide a true user experience that brings value, no matter what the product may be. 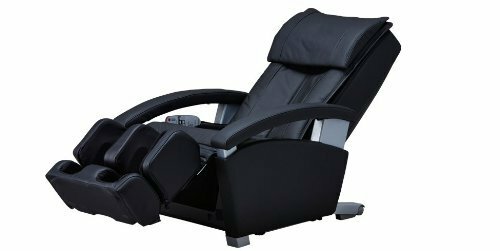 The massage chairs that they create are no exception to this and neither is the EP1285KL. The Panasonic EP1285KL is a chair that has a goal of holistic health. Massages bring value such as relaxation and energy. This chair focuses on providing programming options that do just that. The EP1285KL has selections and settings that can energize the body or provide relaxation, depending on what the case may be. All of these, too, are available with just a few clicks of the remote as well. The design of a massage chair should be considered as much as the massage that it provides. When it comes to the Panasonic EP1285KL, this is not overlooked. The style of the chair is very modern and sleek. With black features and an overall monochromatic design, the chair screams luxury. That is another reason why so many are falling in love with this chair because it really does do more than just massage. It can be a great piece of furniture in a home. There is another great aspect of the Panasonic EP1285KL that cannot be overlooked. This feature is called the ottoman or air ottoman system. The air ottoman helps to provide a deep massage to regions of the body that other chairs forget. Specifically, the air ottoman focuses on the legs. It also adds massage features to the ankles and feet as well. The reason that this is called the air ottoman is because it is created using a system of air bags that apply the pressure and translate the type of massage the user wants to that user. With over ten different air bag and pocket options it is no wonder that the chair is able to give such an effective massage, especially to the calf and lower back region.